Ola Cabs is the Fastest Growing & Most trusted online travel booking platform in India. They are offering Rs. 100 Cash for every friend who installs app and signs up with referral code. Your friend gets Rs. 100. You will also earn extra Rs 100 earning of your friend's booking amount when they travel with OlaCabs. Now after downloading open it and click on sign up. Now enter your name, email id, mobile number. If you Dont Enter this code then you will not get extra Cash ! Now you will get verification code on your mobile. Enter that code to confirm your sign up. Click on upper left corner. There you will see an option of "Invite & Earn". There you will get your own invite code. Share that code with your friend and Your friend get Rs. 100 Cash per And You will Get 200 when your friend booked tickets from olacabs. 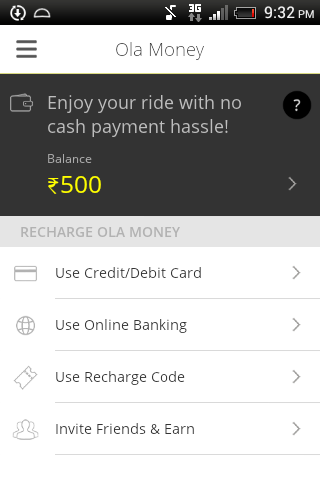 NOTE- If you are new user in ola cab then enter code APP200 for getting free ride.